Five quick and easy things to digest on a Friday! This week it’s five things I hear most often that people want from their manager. 1. Consistency – this includes handling problems and mistakes, treatment of different team members & general mood. We like to know that our leaders uphold consistent standards and to feel that we are treated fairly and with respect. 3. Clarity – I read a survey a while back that suggested one of the greatest causes of stress at work was unclear boundaries. We like to know what’s expected. We like to know what success looks like & to have something concrete to aim for. We like to know our roles & responsibilities, & those of our teammates. Strive for clarity wherever possible. 4. Involvement – On a recent day of staff interviews in preparation for designing a line-manager development programme for a company, the appreciation for managers who were present, visible, approachable and who understood what their team actually did day-to-day was huge. NB. This does not mean micro-management! 5. Feedback – for goodness sake, let us know how we’re doing! Are we on track? Are we doing great? What needs changing? Few things stir unrest like the negative annual appraisal that comes out of the blue. Make feedback regular and routine. Both positive and negative. That’s your Friday Five for this week. Do you agree? Anything else that you’d have in your top five? Have you planned your victory party? On the Foundations of Success workshop, I introduce four Success Foundations. This is a great starting point. Define goals clearly. Are you aware though that you can significantly increase the compelling power of those goals to enthuse and energise people (including yourself) to give very best efforts, when you plan and communicate how you’ll celebrate when you get there? My son’s Year 5 class knows if they’ve get a certain number of merit marks in a week, that means Friday afternoon Golden Hour! Sports teams plan their open-top bus parades. Marathon runners salivate over their planned post-race meal! This can work with the big, hairy long-term goals and just as well with the small ones. Try it this week. Define an aspect of success that’s achievable by the end of this week and be specific about how you’ll celebrate when it’s done. P.S. Interested in further leadership ideas & discussion? I’m excited about my new Total Leader Facebook Group for developing ideas & discussion that will help leaders with the day-to-day joys & challenges of leading. It’s a closed, moderated group so won’t be full of spam and drivel and I’d like to invite you to be one of my specially invited founder members – join here. I knew the rules but not how to win! In our house board games are big! We love them! The old classics – Monopoly, Cluedo, Scrabble. There are some fantastic new kids on the block, our current favourite being Sequence. 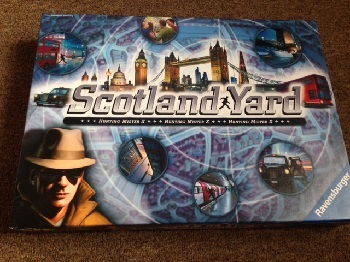 One of the kids’ birthdays recently yielded a new delight – a game called Scotland Yard. There is great excitement in the house when a new game is being unveiled and the learning of the rules followed by those first few run-throughs is an almost-sacred ritual! On this occasion I was not around when the cellophane was pierced and the game learnt. Neither was I present for the second and third outings. The rest of Team Howes had become fairly well versed in this new entertainment and I was at a significant disadvantage. Finally I get to play and the kids explain the rules to me. This piece moves here. This card does that. You can’t lay this card when that happens. You must collect six of these before you can do this. Ok, I think I understand the rules. But what’s the aim of the game? How do I win? This was the bit that was not so well explained by the kids in their eagerness to get started…and beat me! I find myself in the middle of the game, asking questions as we go and squinting at the tiny instructions without my glasses to try and make sense as we went along as to how the game eventually gets won. Work can feel like that. Sometimes for the owners / leaders…often for staff. I know what I’m supposed to be getting on with, but how do we win? What does success look like? How does today, or this week really count? We want (and for our own well-being, need) to succeed. Victories keep us fresh, energised and creative. Knowing the rules without having a clear and imminent sense of a goal to reach, a finish line to cross, it’s drudgery and no-wonder the productivity levels aren’t what they could be. Whether it’s for yourself, or for those you lead, make it clear where the next finish lines to cross are, and make a deal of it when the tape is broken. Mine today was a short list of ‘Must do today’ tasks, the last of which was writing this blog. My prize – I’m off to make a fresh pot of very nice coffee! We know 10,000 facts about keys. He was clearly fed up with having to explain this to another customer. ‘They’ had done it again. The very use of the word ‘they’ gives so much away. He – the guy on the front line dealing with customers – had no involvement, connection or ownership of what ‘they’ had done. People don’t so much like having things done to them, or thrown at them. People generally like to be involved, to feel valued and to be treated with a bit of general kindness – especially if they are the ones who have to live with the consequences of what is decided day-in and day-out…which ‘they’ never do. I’ve seen this kind of thing happen so many times. To manage and lead well takes more time and requires extra effort but the benefits to be gained and the losses to be avoided by doing so are enormous, both on the happiness of staff and the profitability of the business. It’s a good reminder to us all – Think very carefully before directing a sign to go up in someone else’s workplace that they have had, and want (as they will gladly tell the customers) nothing to do with.